"I extremely happy with the quality of the rods"
You can make a huge difference with a very small project of changing the knobs and pulls in your home. By getting premium custom designed knobs and pulls for your home you can make it unique. Surfaces made of plastic, stainless steel, wood and other such material or alloy are widely used, because of their cheap rates. But they allow hazardous bacteria to survive and spread when you touch handles, pulls or any knobs made from these alloys.. These bacteria's are generally persist on door pulls, push plates, door push, door knocker, cabinet knobs, etc. These are the primary sources of harmful viruses and bacteria's, which we frequently come across in our daily life. Copper surfaces kills several deadly bacteria. Replacing current furniture handles and hooks etc made of brass reduces around 82 to 83% amount of bacteria on their surfaces. You can say, these bacteria do not die, it's an endless chain of their growth. DNA is passed on to other bacteria and new born bacteria can survive for even a months and chain continues. And in turn we face the severe health issues. Not just that, we also become the spreading agent for such deadly bacteria's. Replacing these alloys with brass, certainly kills these bacteria and their DNA as well. We cannot avoid handling these allows in public places, but at least, we can start from our home and start staying healthy. These antibiotic resistant bacteria can survive for weeks on stainless steel surfaces. But they don't mess up with brass surfaces and die within few minutes or less than an hour. 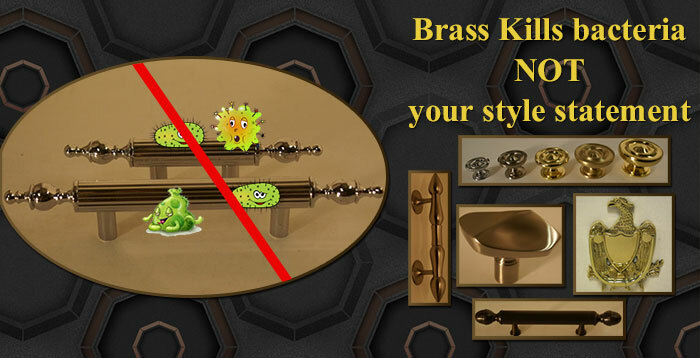 Brass or copper surfaces have great intrinsic property to destroy such harmful microorganism. Growth of these bacteria starts with one and then multiply in numbers and production enters into endless cycle, but their reproduction is rapidly degraded on brass surfaces. So, I guess we have got the reason why brass was used on a large scale in the classic era. Due to its scientific benefits and elegant styling. We at singnatureThings do care about you, and hence we have all the products which certainly take's care of your health without compromising on your style statement.